Helping Young Models Start their Careers! With this contest The Makeup Studio is looking for the young Ladies and Men who wish to become models. The winners will get their first Look Book / Portfolio paid for, with a full Photo Shoot, Makeup, Hair, Styling & Coaching so they can have the tools to start their careers! 1 Grand Prize winner will be featured in a S.E. Asia Ad Campaign with NYX Cosmetics! Contestants will sign a release and have pictures taken at the Studio. Just make sure you wear simple clothes and no makeup. Public Voting will start on November 17th at 4PM thru November 22nd 12PM. The Top 15 Finalists will have “call back” on November 24th at 11AM. The Top 15 Finalists will be listed, and the Judges panel will select the 3 Female and 2 Male winners. The Top 15 will be in a Fashion Show on November 30th where the winners will be announced. The winners will be awarded on November 30th at the Fashion show at Little Thao Dien at 7PM. Grand Prize: 1 Model will be featured in a S.E. Asia Ad Campaign with NYX Cosmetics! Five 1st Prizes -> More than 500,000,000 VND in total Value! * Full Makeup test session with Rayssa B. @ The Makeup Studio: to prepare for your private Photo Shoot to find the “looks you love”. * Full Makeup session the ‘day of photo shoot’. * Full Hair Style with Jasmine Spa to prepare for Photo Shoot. * Full Photo shoot with up to 5 Costume changes with Truc Photography. * Finished “Comp Card” to find work or an agency, with 4 shots of your choice and your contact information. 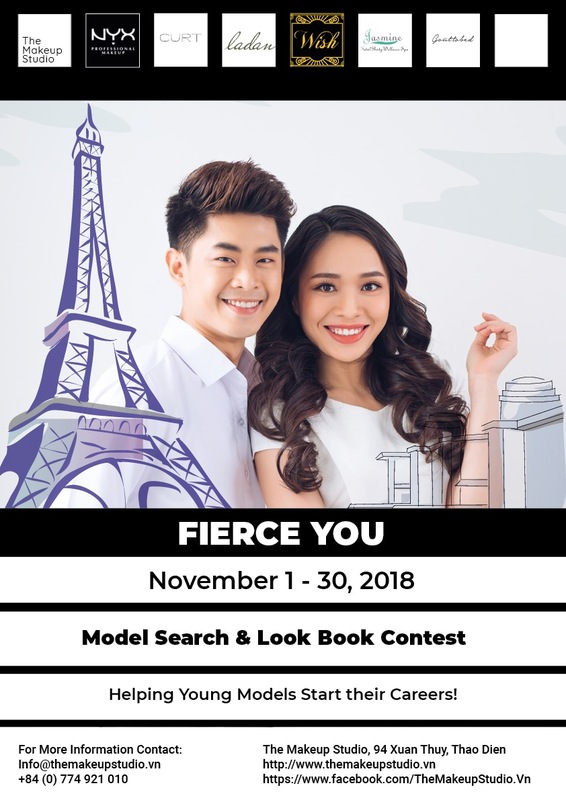 **All contestants may enter in person at the office of The Makeup Studio in Thao Dien on any day of the week, during normal business hours, by appointment, if they cannot make the Open Registration dates.